Argentière snow history, including snow pack depths reported for high and low slopes through the most recent ski seasons. 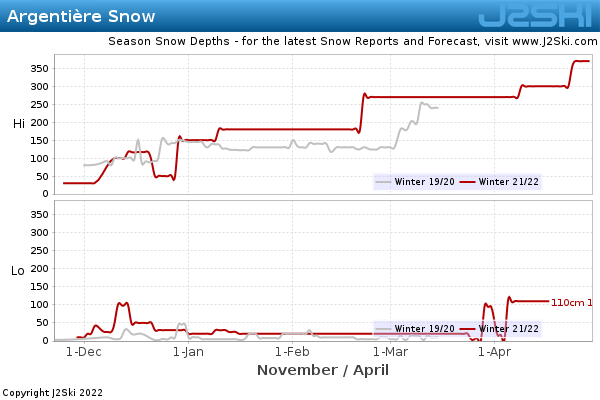 This chart shows the snow depth changes in Argentière through the current ski season, compared to the previous winter. Snow reported by Argentière so far in 2018/2019 has hit 205cm81in on Friday 15th March 2019. Snow reported by Argentière in the 2017/2018 ski season reached 370cm146in on Saturday 10th February 2018. Note that snow history is not a predictor of future snow depths; it simply shows you how much snow accumulated in Argentière that winter. Before skiing or snowboarding off-piste in Argentière, you must assess the local snow conditions. Always check the local Avalanche Risk Level and ski with appropriate safety equipment. Create your own J2Ski Account to get Free Snow Reports and Forecast, with Powder Alerts, for Argentière. Powder Possible :- 41cm16in of Fresh Snow is forecast for Argentière over the next 2 days. Chamonix (8km5 miles from Argentière) is reporting "Spring Snow". Past season snow depths for other popular Ski Areas near Argentière. Note :- The Snow History for Argentière, on J2Ski, is updated frequently and subject to significant change; snow depths and skiing conditions vary rapidly, as can all Mountain Weather Forecasts.